BATTLESHIP: Review- Sinking Ship Saved by Visual Effects! Hasbro has joined forces with Universal Pictures to bring the term “you sunk my battleship” to a tangible reality in the film “Battleship”, directed by Peter Berg (Hancock, Friday Night Lights), about Naval officers steering clear of invading Alien vessels threatening to take over planet Earth. At the center of this battle are two brothers- Alex (Taylor Kitsch) and Stone Hopper (Alexander Skarsgard). Alex starts out in the movie as an intelligent slacker whom needs to apply himself and get motivated to move off of his brother’s couch, get a job and become a productive member of society. Alex’s older brother Stone is a commanding officer of USS Sampson. After Alex pulls his last stunt inspired by a beautiful young woman Sam Shane (Brooklyn Decker) and the daughter of Admiral Shane (Liam Neeson), who quickly becomes his girlfriend, that results in him getting tased. Stone insists he join the Navy. Also starring singer Rihanna in her film debut as Petty Officer 2nd Class Cora Raikes. She’s the one that gets to fire the missiles! Rihanna with lead actor Taylor Kitsch. This new venture for Alex at first is literally fun-and-games as he participates in the “Rimpac”, the largest international war games. Upon sailing back out to sea is when the planet comes under attack by huge alien sea robots as well as hitting terrestrially in targeted cities: Scotland, France, Iowa, Hong Kong and Hawaii where the movie takes place. What could be the root of all this? Military officers in the movie stated that in 2005, scientists discovered a planet with a climate similar to Earth. And, this project is called the “Beacon Project”. When the United States sent out a signal, it got back an alien response. The invading group of aliens picked Hawaii as the main target because it happens to be the only place in which they are able to send a direct message to their planet to send more alien troops to Earth. Within a closed-off proximately, brothers Alex and Stone must dictate orders for the crews on each of their ships – Alex’s is destroyer ship John Paul Jones and Stone’s is called Sampson. With five alien vessels to ward off and eliminate, the fight doesn’t go down without the sinking of a ship or two. This results in the John Paul Jones going down in traditional Titanic style. A similar scene is used here as well as in “Pirates: Band of Misfits” where the propellers are spinning as the people must escape the ship. Alex is left with full crew, but without a ship and without a brother. Eating his own words of comparing a “battleship” with a “destroyer” in that the battleship is like a dinosaur and the destroyer is like the terminator that will not go down, Alex takes charge of a new ship, the “Missouri” – a battleship that is 70 years old, operating in all analog -that means manually with mathematics figuring out coordinates. The Missouri also comes with most of its original Pearl Harbor Vets, now in their 60s and 70s. This becomes a very patriotic scene- watching heroes of past working against an invasion with current heroes in-the-making. Though receiving first-billing in the post film credits, Rhianna took a back seat and was utilized as a less impactful version of characters typically played by actress Michelle Rodriguez. Main actor Taylor Kitsch, previous work includes: “X-Men Orgins: Wolverine”, and “John Carter”, took-on a Josh Duhamel type performance and look. The best and most memorable performances came from Liam Neeson, Gregory D. Gadson who plays a double leg amputee retired Colonel Mick, Hamish Linklater as Scientist Cal Zapata, Tadanobu Asano as Nagata, and Jesse Plemons as Ordy. “Battleship” resonated a typical “Independence Day” style/propaganda film. 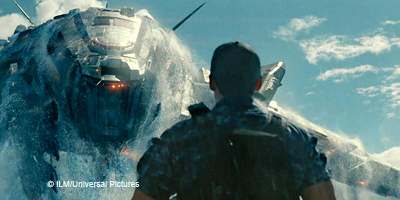 The most appreciative part of “Battleship” was the CGI which was demonstrated in top-notch. Many times during action scenes, the film feels like it’s taking you on an amusement park ride, and when it’s not doing that, it feels like you’re inside a very high quality video game. The underlying theme for all male characters in “Battleship” was each of them displaying their own war-fighting, survivalist skills in proving their masculinity to others and validating it to themselves. The final war scene in “Battleship” makes-up for any and all other short-comings the movie may have. MOVIEGOERS- There is a bonus scene after the end credits. “Battleship” opens in theaters Friday, May 18, 2012.